The Cot Blanket was worked for a private client. The brief was to produce an heirloom, so a lot of thought, care, and consultation went into it. In keeping with the "heirloom" brief, I chose to use cashmere blanketing (sourced during a fortuitous visit to Australia, as it is almost impossible to source in the UK) and embroidered it using Paterayan "Persian" Wool, stranded cotton and variegated Pearl Cotton from Coats Anchor. In the bottom left-hand corner is a rendering of the logo of the family business, including one of my favourite stitches (braid stitch), while the child's initials are in the top right, stitched in heavy chain stitch to produce a smooth, clear line. The whole piece is lined with a light silk so that little kicking feet don't wear away the stitching at the back. 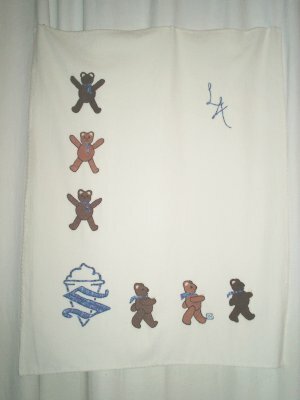 The middle marching teddy at the bottom is kicking a cartouche in which the work is signed in Morse code. I've decided to do this in future, as commissioned work should be signed, but stitched signatures can all too easily become clumsy. One of RachelWright's Needlework Projects.